Clienteling Not “Client Telling” ! The latest buzz word in retail is “Clienteling“. This is where stores are getting their sales associates to proactively communicate with previous customers to inform them of news. From a customer’s perspective, this means that you will soon be getting “cold calls” from MANY stores in the very near future !! I’m sure that some stores will do clienteling correctly, but most stores will do client telling. 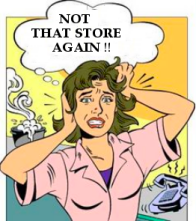 So how should REAL retail clienteling be done correctly ? 1) An honest introduction to the concept – Sales associates need to be honest and inform the customer that their role is being expanded so that they can contact customers directly (if the customer agrees). 2) An introduction to the sales associate - The sales associate needs to communicate exactly who they are and why they are worthy of being a “point of contact”. A picture, a short career bio, and some insight into the sales associate’s expertise and personality will make a huge difference when building a relationship. 3) A written statement of benefits – Give the customer an itemized list of the benefits that they would get by participating. If they are NOT convinced of these benefits in the early stages of communications, they will always view these contacts as annoying. 4) A formal opt-in process – The customer should fill in a form with their preferred method of contact (email, text, phone), and their personal interests (sales, new product introductions, events, etc), and any other requests regarding the associate-customer relationship. In conclusion, I recommend that EVERY sales associate needs to have their own personal flyer that contains the four elements above. This is how one starts a professional two-way relationship.